The songs of Nick Cave & The Bad Seeds in a whole new voice. Irish-French powerhouse singer Camille O’Sullivan reinvents the songs of Nick Cave & The Bad Seeds through her unmistakable wit, style and theatricality. 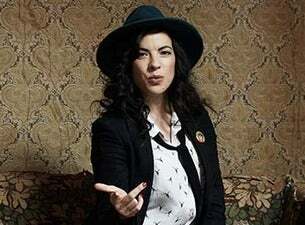 A favourite of Yoko Ono, Jools Holland and Auckland concertgoers, Camille O'Sullivan has seduced audiences around the world with her sultry, spellbinding performances of statement-making music by Radiohead, Tom Waits, Leonard Cohen, David Bowie and more. This luminous new show is devoted entirely to Nick Cave & The Bad Seeds – both the iconic songs and the band’s intense, macabre sense of rock poetry – as reinvented by O’Sullivan. Capturing the essence of an artist of many guises – at once violent, beautiful, logical, crazy, devout, troubled and religious – Cave is a passionate, unique interpretation of brilliant music. Famous for her rendition of ‘The Ship Song’, there’s no better performer to take us on the journey than Camille. A scintillating concert fit for the epic Civic stage.